Figure 1. 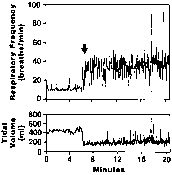 A breath-by-breath plot of respiratory frequency and tidal volume in a patient who failed a weaning trial. 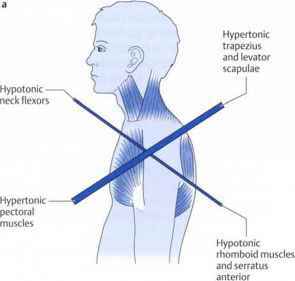 The arrow indicates the point of resuming spontaneous breathing following discontinuation of ventilator support. Rapid, shallow breathing developed almost immediately, suggesting the prompt establishment of a new steady state. Although it has been considered that rapid, shallow breathing may reflect the presence of respiratory muscle fatigue, its almost instantaneous development without subsequent progression is difficult to reconcile with the development of respiratory muscle fatigue. Reprinted by permission from Reference 13.
from the first recorded value, ventilator support became necessary within the next 36 hours. Rieder and coworkers (34) examined the accuracy of vital capacity in predicting the need for mechanical ventilation in patients with myasthenia gravis. The study consisted of a retrospective chart review of five patients who experienced 10 episodes of acute respiratory failure. Repeated measurements of vital capacity every 4 hours did not help in predicting the need for intubation and mechanical ventilation, which was instituted in four of the episodes. Indeed, the lowest values of vital capacity tended to be found in the patients who did not receive mechanical ventilation, mean ± SD 11 ± 5 ml/kg, compared with 21 ± 9 ml/kg in the patients who received ventilator support. Although the study population is small, the results suggest that vital capacity is unlikely to be useful in this disease. The inability to predict deterioration may be due to the erratic course of this disease, which involves sudden deterioration (see Static Lung Volumes in Section 1 and Devices Used to Monitor Breathing in Section 6 of this Statement).